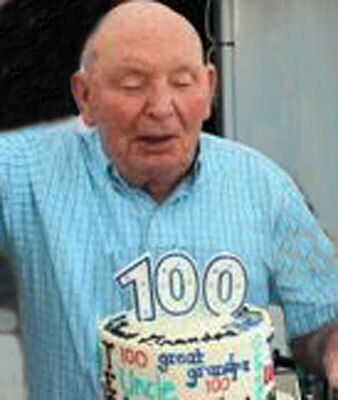 THEMOND ''TED'' JESS CRITES SUMMERFIELD, FLA. – Themond “Ted” Jess Crites, 100, successfully completed his earthly journey, Saturday, April 9, 2016, at home, surrounded by his daughter and son-in-law, Chuck and Jeannette Flynn in Summerfield. Ted was born in Phalanx on June 12, 1915, and married his childhood sweetheart, Edna Mildred Thompson on June 12, 1939. Edna preceded her husband in death on April 20, 2012, at the age of 92. Ted and Edna had four children, nine grandchildren and 10 great-grandchildren. In addition, they loved their nieces, nephews, and extended families, as well as a host of friends from many states who were among their earthly treasures. They served for many decades in three congregations that were very significant to their hearts and faith, the First Church of God in Newton Falls, the First Church of God in Mineral Ridge, and the First Church of God in Inverness. Viewing will begin at 9 a.m. on Saturday, April 16, 2016, at the James Funeral Home in Newton Falls, with a memorial service following at 10 a.m.
Family and friends are welcome. Ted will be laid to rest beside his wife, Edna, with full military honors at Green Haven Memorial Gardens in Canfield. The family has requested that, in lieu of flowers, all donations would go to either the First Church of God, 5510 E. Jasmine Lane, Inverness, FL 34453-1071, or to NEO Campgrounds, c/o JD Klinesmith, 16278 Shilling Road, Berlin Center, OH 44401, in memory of Ted and Edna Crites. Please share your memories of Themond.